JD did our initial Pest control treatment, and he was AWESOME SAUCE! Look forward to working with Accel! These guys are great! They keep on top of any request and are proficient and fixing my pest issues! Keep up the great work! This is the most professional pest control service company we have ever dealt with in our 15 years of being in business. Courteous staff, great service, accommodating, and they get the job done! I am happy, THOUGH each time we've had company, we've had mosquitoes. My wife makes a good point.... IF we can;t sit outside with the mosquitoes as is now, then why are we paying for service? also cost seems high for 5-7 minutes of spraying. Used to be the spraying included the lawn and all perimeters of the backyard, now it is just the back fence of the backyard. Our technician was great!! Professional and personable, service was done in a timely manner and we are happy with the our results so far. Definitely recommend Accel. Thanks for your help! Things are looking better. Quick and friendly service! They we're on time and gave exactly what they promised at the price they quoted! They even let us wait until the closing of the sale of our house to pay, which was very helpful! The day they put down the bait box I haven’t seen a mouse/rat since. They are prompt and courteous. They leave work orders to let you know they’ve been there and what they did. Highly recommend them. On time and provided the requested services fast. They provided professional and timely service. 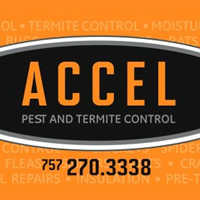 My prior pest control provider was no longer in business and not only was Accel willing to take over the service but they went above and beyond. We've used Accel's services for years at our home. I recently had them come out to a rental property. Nothing but good things to say about the office staff and technicians. Even when I have a problem in between our quarterly treatments, they schedule something for me in days. What I like the most is that Mike is the technician that's come out to the house regularly. Super nice guy and very thorough and explains everything to a tee. He's more like a friend now. I recommend Accel all the time! Very professional and courteous. Pleased with their service. They performed the service when they said they would! Follow up visit is coming up! Super nice. Great communication. Answers and explains anything asked. Very patient and understanding. Technician “D” was on time. He worked steadily throughout the day to get the job done in spite of the heat. I appreciate his hard work and perseverance. Tech’s were very efficient and knowledgeable! Got right to work and got it done. Also did everything I asked about. Prompt and efficient service, as always. He walks and inspect all around the house and make suggestions about further treatments. Very pleased with our service so far. Dontre Hall was a great technician. He was very friendly and worked very hard to make sure everything was perfect. We haven't seen one bug in the house so far. Thank you Dontre! I called and they came running. Super fast service. Friendly folks. Will use them again. Thanks. Great job. Great service. Good people. I couldn’t be any happier with my service. Accel contacts me when it’s time for my service, they set the appointment and complete the service. I haven’t had any issues, any questions I have had have been answered promptly. I would highly recommend them. Thank you for responding quickly to our emergency! Dan was very professional and polite. We have a persistent ant problem, so Dan had to come back for a second treatment. He kept a good attitude,did what he had to do and so far so good. Although we do see a sporadic ant from time to time, so I won't be surprised if we'll need another treatment soon. Knowledgeable, friendly, service is excellent great customer service. Mike is thorough, knowledgeable and personable. He provides excellent service and I am satisfied with Accel Pest and Termite Control. I highly recommend Accel. I’ve dealt with quite a few exterminators in the past, but Accel has been the only one to eliminate the problem! I’m very happy with their service. Easy to contact and schedule! Quick, painless process with Accel!